Hope: which Aristotle called a “waking dream,” is associated with imagination and wishful thinking. Anthropologist Cheryl Mattingly analyzes hope as a culturally and structurally situated practice that involves deep contemplation about what it means to have a good life and be a good person in the wake of suffering. There is a commonly held belief that optimists are healthier people, and there are even some studies that suggest the same. Social support and a positive mental attitude may indeed contribute to person feeling better emotionally. However, there is no evidence that a positive attitude such as having a “fighting spirit” positively impacts cancer progression or survival. Clinical health psychologist at the University of Pennsylvania and Co-Leader of the Cancer Control and Outcomes Program at the Abramson Cancer Center at Penn, Dr. James Coyne points out that having a positive outlook may bring benefits to cancer patients, but there is no evidence that it prolongs life. One of the largest studies to date on attitudes and cancer showed no link between personality and cancer risk or survival. People who think optimistically get cancer and die from cancer at the same rates as people who do not. Although it has not been shown to have survival benefits, representations of breast cancer tend to depict the same story of hope, courage, and inspiration. By assigning positive meaning to breast cancer and bearing witness to it through personal experience, the language and symbolism within the story help to produce a kind of reality about breast cancer, one that may or may not exist in actual reality. Yet, the continual retelling of the story presents it as universal. 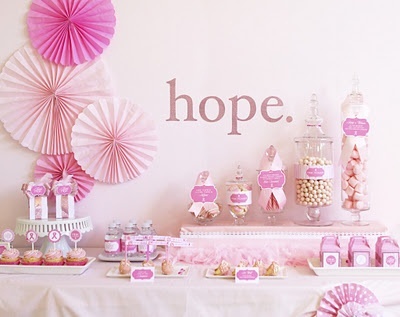 Advertisements and products in pink ribbon culture use the word hope to generate feelings that will encourage potential consumers to participate in pink consumption and also feel hopeful about what their participation might accomplish. How individuals experience hope in the face of challenging and traumatic experiences is a personal decision. The array of hopeful pink party supplies, t-shirts, and other hope-filled paraphernalia fuel a pink ribbon economy. When people participate in pink ribbon events, display pink lifestyle products, and give pink ribbon products as gifts, they offer hope. But they also function as transmitters of a consumer-oriented version of hope that keeps the pink ribbon wheels turning. In addition spreading the message of hope throughout the breast cancer marketplace, hope is equated with beauty, thereby tapping into the cosmetics industry and all other products that emphasize femininity. Despite evidence to the contrary, there is a strong societal push to be positive and upbeat especially in the cancer world. Seldom do we see what it is like to endure ongoing treatments, side effects, emotional distress, compromised function, and the difficulties and uplifts of everyday living. Even those who die have their stories framed in terms of fighting courageously to the end. These “she-roic” stories accentuate triumphant survivorship in a way that marginalizes those who do not, or cannot, fit the model. Suppressing the full range of emotions to be outwardly cheerful may mean that one’s emotional and practical needs will not be met. The emotional work to display optimism when a person does not authentically feel it may also contribute to added stress, which is shown to have physiological implications that contribute to negative health outcomes. When the overemphasis on positive thinking places the burden of healing on the sick, it diverts attention from the social determinants of health—such as treatment modalities, access to care, support networks, and other factors known to influence healing processes. The mandate for optimism creates a controlling image: the triumphant survivor — one who cheerfully lives on, beating the disease, and suggesting intrinsically that those who do not survive simply are not optimistic enough. Expectations that one should use a positive mindset to beat cancer fuel posthumous narratives as well, paying tribute to a battle courageously fought. Illnesses and other traumatic experiences have the potential to present people with opportunities for reflection and change that may have positive effects on various aspects of their lives. But the overemphasis on optimism conceals suffering and distress based on the misguided belief that it will afford survival benefits.